Under different circumstances, the dark waters of the Guelta d’Archei might not be so appealing. Stained by camel droppings and patrolled by small crocodiles, it doesn’t look like your average swimming hole. 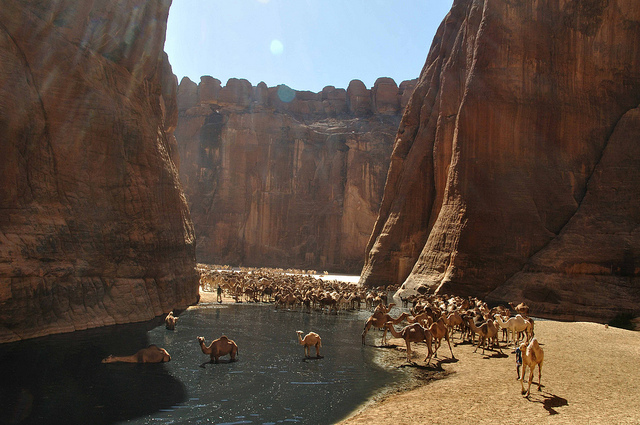 But this ancient guelta — the North African word for a desert pool — is definitely not your average anything. 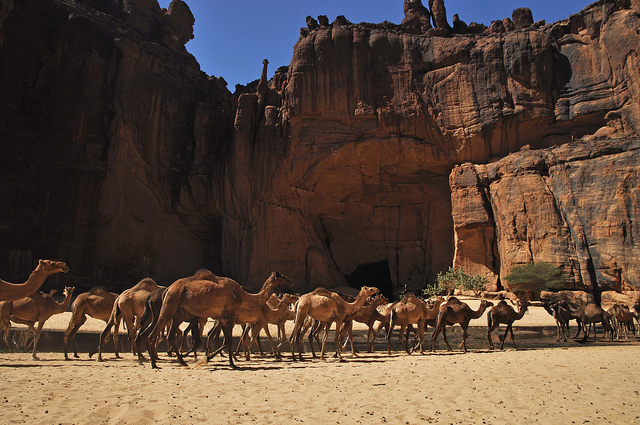 Located a four-day journey across the Sahara Desert from n’Djamena, the capital of Chad, the Guelta d’Archei is a thousand-year-old reminder of greener days in this now barren landscape. Paintings on the looming cliff walls date back to the Holocene era, more than 5,000 years ago when the desert bloomed and life was abundant. 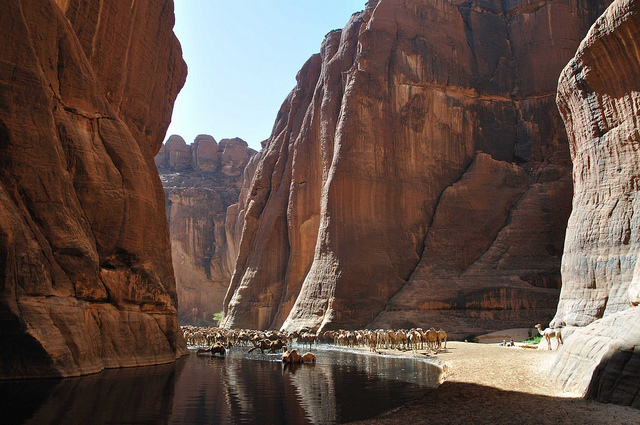 The Guelta d’Archei is a permanent oasis fed by the water table deep beneath the desert floor. 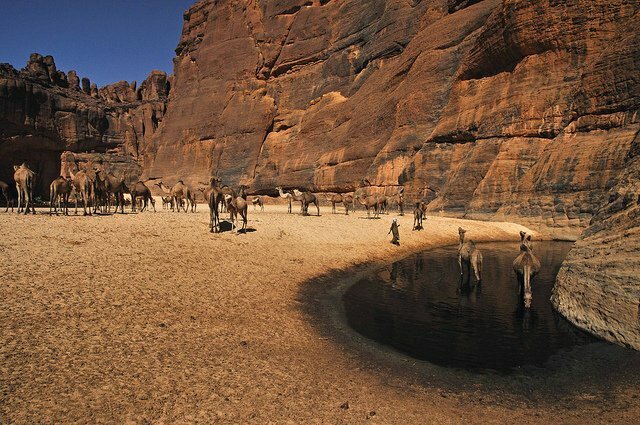 Tucked away among the wind-eroded towers of the Ennedi Massif, this hidden oasis is a well-known pit stop for desert travelers, and it’s been so for a very long time. 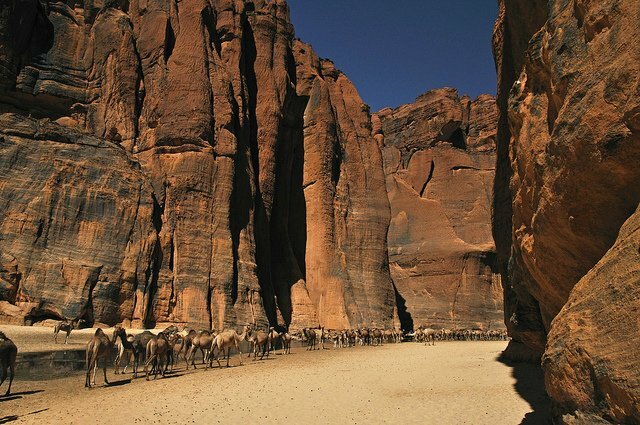 Caravans crossing the Sahara stop here to rest and refill their supplies of water; and the canyon walls frequently echo with the bellowing of camels. Thousands of years ago, this was a verdant landscape full of life, but today it is one of the harshest environments in the world. Pools like this one provide support for the few remaining animals in the area. 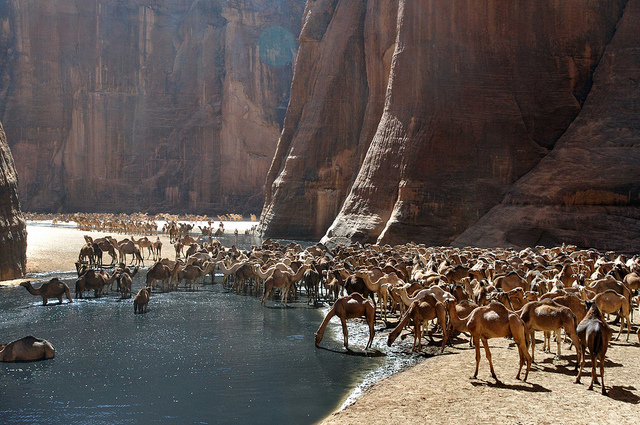 While rare desert antelopes (called “oryx”) may visit the Guelta d’Archei occasionally, the most common animal seen here — other than the great camel caravans — is the dwarf Nile crocodile. These crocs are very likely descendants of crocodiles who were trapped here a millennium ago when the desert expanded. 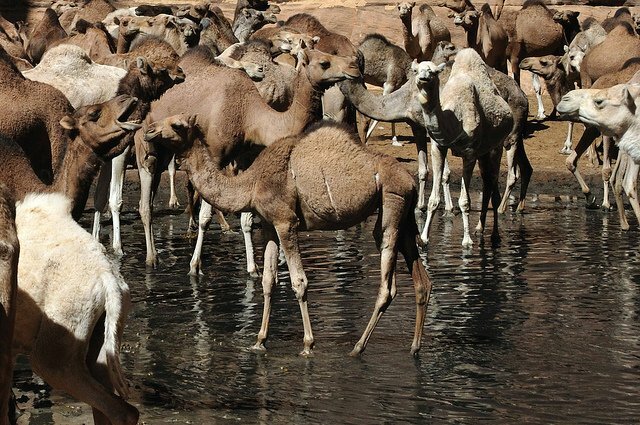 Now they’re dependent on the visiting camels for their survival. The abundance of camel droppings in the water creates large blooms of algae — and that’s the crocodiles’ main diet. 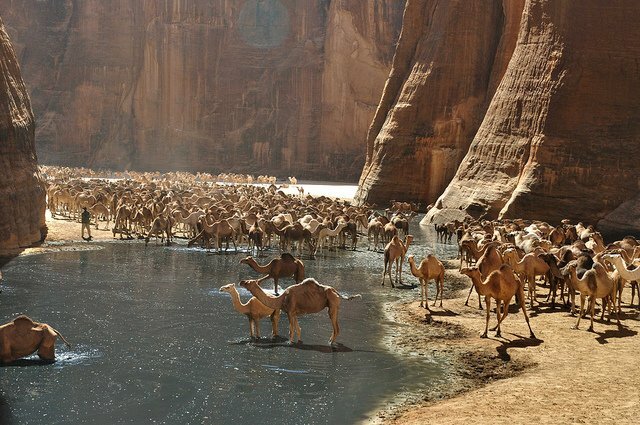 The Guelta d’Archei is a rare jewel in the desert — and a welcome resting place for humans and animals alike in the endless, unforgiving landscape of the Sahara.